The Territorial Legislature at Omaha drew the boundaries of Lancaster County in 1855. Settlers first arrived in 1856 and a county government was established "on paper" in 1859. Methodist Elder John M. Young arrived at the head of a colony in 1863, staked out claims, and laid out the townsite of Lancaster centered on this block the following year. Young erected on the block a two-story female seminary which served as a school and religious-governmental meeting hall before burning in 1867. The destiny of Lancaster, population 30, was determined in County Commissioner William T. Donovan's home (located near 9th and Q Streets) on July 29, 1867. There the State Capital Commission (Governor David Butler, Secretary of State Thomas P. Kennard, and State Auditor John Gillespie), after traveling throughout eastern Nebraska, designated Lancaster the site of the new seat of State Government to be known as Lincoln after the martyred President. This block accommodated much of Lincoln's early commerce: hotels, business houses, stagecoach depot, government offices, and religious halls. Lincoln's first church building, erected on this corner in 1968, was the predecessor to St. Paul's Methodist Church, 12th and M Streets. 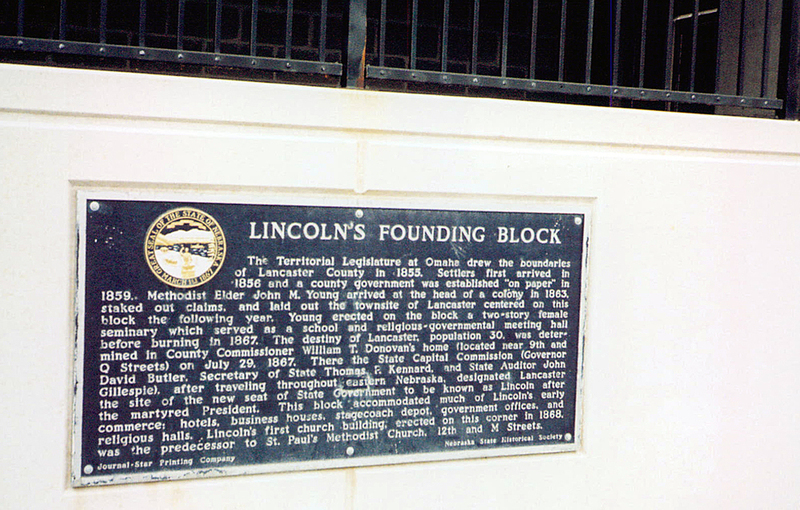 “Lincoln's Founding Block,” Explore Nebraska History, accessed April 19, 2019, https://mynehistory.com/items/show/324.